Note how the And extension method can be used by both “then” (true) and “else” (false) sides of the conditional because the Else extension method returns !b. What gives Open Source a bad rep? 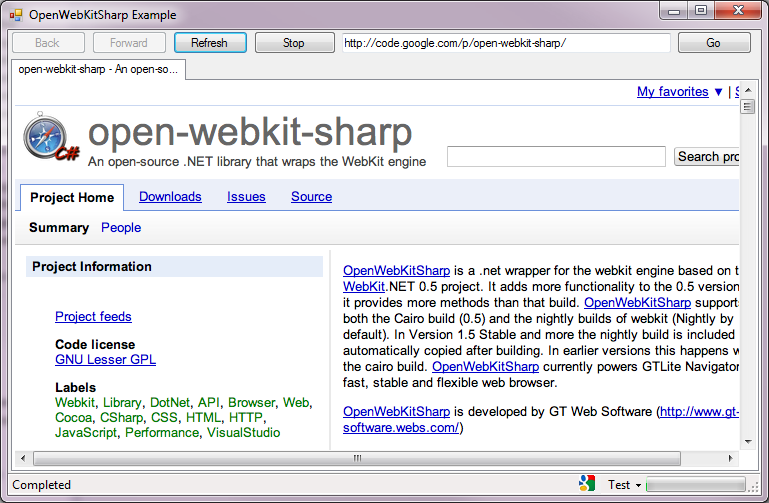 It’s projects like open-webkit-sharp, where the source code doesn’t compile (whether you’re using the SVN pull or the download package), where the project setup is different depending on whether you’re using Visual Studio 2010 or 2012, and where the binaries don’t run without errors. I could go on, describing poorly formatted code, compiler warnings that are so obscure because they don’t normally happen, overriding assembly names from their namespace names, leaving a trail of five different versions of the same assembly but each having a different size and timestamp, local structs that duplicate the same struct by the same namespace and name in referenced assemblies, oh wait, I wasn’t going to go on. That said, after spending about a day on it, I was able to get the code to compile and execute. I cleaned up the warnings, and I offer a snapshot of my folder to anyone who wants to download it – you will have to email me though, as I don’t want to provide a direct link to a 28MB zip file on a public blog. Note that this is a VS2012 build. And yes, it even builds in Debug mode. One of the most obscure things I had to deal with was embedded interop, which turned out (thank you stackoverflow.com) to be simple enough–right click on the assembly in the references section of the project, select Properties from the popup menu, and set the “Embed Interop Types” property value to false.